I met Kevin Tinsley at the very first of Wizard's Philly cons two years ago, shortly after he'd released his Digital Prepress for Comic Books [a truly indispensable guide for those who want to know exactly how the pros put together comics for publication]. We talked about that book, and his plans to enter the comics arena himself. If memory serves, when I asked him what prompted that decision, he displayed that wry smile he wears so often, laughed and said, "Well, after doing Prepress, I figured it was time for me to put up or shut up!" Well, there's no need for Tinsley to shut up, or to stop releasing his own comics. 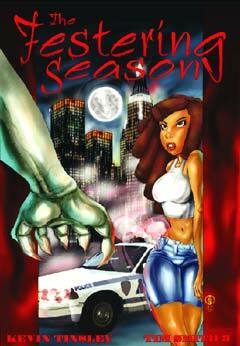 His first creative endeavor, Homebrew: The Festering Season, proved to be not just an entertaining and interesting twist on the "Voodoo hits the big American city" trope, but also a highly entertaining and taut thriller that effectively mixed the conceit of warring magics with the reality of troubled race relations in NYC. His newest release, Stonehaven: Milk Cartoons & Dog Biscuits, hits the shelves of comic shops and book stores nationwide today, and promises to win him an even wider audience with its heady and sly blending of gritty detective and urban fantasy fictions, all of which is served up with wit and aplomb. Bill Baker: How would you describe Stonehaven: Milk Cartons & Dog Biscuits? Kevin Tinsley: A contemporary fantasy. Basically, it utilizes the idea of taking legends and folklore, similar to what you may find in role playing games like D&D, but then advancing it to a modern day time. BB: I got the distinct feeling that the city of Stonehaven, perhaps as much as any of the flesh-and-blood characters themselves, plays a large role in this tale. Would you agree with that assessment, or am I suffering from reviewer hallucinations? KT: No hallucinations there. 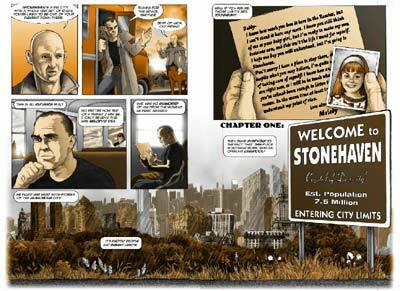 In fact, the setting is the common thread that will run throughout the series of graphic novels. The characters are an ensemble cast, so that an character's role varies in importance from one story to the next. And no one appears in every single story, except for the city itself. This also allows me to blend many different genres into the overall fantasy element. And as the stories progress, the city will become more and more defined, both 'physically' and thematically. BB: Who are some of the major players in this book, and what are their relationships to each other? KT: The story of Milk Cartons & Dog Biscuits was really created to introduce the readers to the city itself -- almost to the point of playing down the fantasy elements entirely. To this end, the story is told from the vantage point of an outsider passing through. This is Dan Parsons, a State Ranger in search of his runaway daughter. Being a law officer himself, he realizes that the City Guard are too overwhelmed by the day-to-day policing of the city to be of much help. 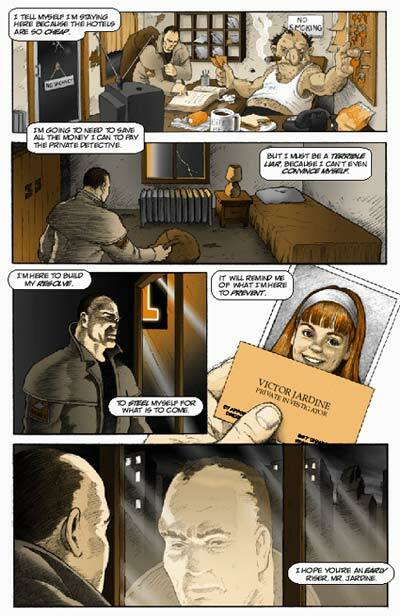 This leads him to the second major character, Victor Jardine, a half-elf private detective. I see Victor as the Everyman character. His main goal is to keep his head above water and pay the rent. And although he is definitely a man of questionable morals, he still tries to do the right thing when possible. Victor embodies the Jack Nicholson line from The Two Jakes, "In this town, I'm the leper with the most fingers." And last but not least, there is Meili Mau (pronounced may-lay MOW). She is a notorious enforcer for the local Asian crime syndicate. Here we have a very bad person who lives by a very strict code of duty and honor. In this story, she happens to being doing the right thing, but for all the wrong reasons. These characters are following a theme I continue to pursue throughout this series in exploring the concepts of good and evil. Sure, there are people out there who are strictly one or the other, but they are rare. Most people fall into that grey area in-between, and I find it more intriguing to pursue those people who truly have to figure out what is right from wrong. BB: Where'd the original idea for this genre-bending tale come from, how'd you develop into the form we now see, and how long did that process take? Also, what are some of the major differences between the final product and what you originally envisioned? KT: Wow, where to begin? I suppose the idea for the series germinated during college, when I played a variety of different role-playing games. Not just D&D, but super hero and science fiction games as well. I was also interested in 'alternate-history' types of literature. The series finally started really shaping up around 1991, when I pitched the idea as an ongoing series for the Epic line at Marvel Comics. The proposal consisted of a 10 page comic book introduction of the series and characters, and a brief synopsis of the first 12 issues. Ultimately it got rejected, but over the years I kept returning to it, refining it. Story Ideas kept creeping into my head and I just couldn't let it go. 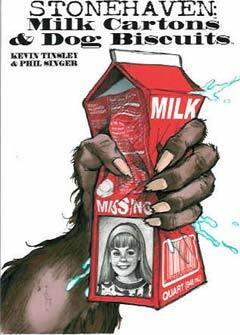 Milk Cartons was to be the first three issue story arc and the introduction to the series. It has remained surprisingly intact over the years. It became longer as I fleshed out the characters more, and as I lay the groundwork for future stories. As for the other stories in that proposal, several were combined together and will be published in future editions of this series. Others were disregarded as the series became more defined in my own head. Actually I'm a little thankful it got rejected back then. I'm far happier with what I have in my head now. I suppose the only real drawback to having worked on a project for ten years before publishing it is that I now have more ideas than I will ever have time to complete. BB: You've came up with an interesting mix of the magical and mundane for this universe, a world with an air of familiarity that's underscored with a real sense of untold or even hidden history. What does this approach allow you to do, storytelling-wise and thematically, that you might not be able to do if you set it in a straight forward, "realistic" world? KT: This approach of alternative-history writing is incredibly liberating and invigorating to the creative process. It enables me to explore themes and ideas by completely turning them on their heads. I minored in philosophy and religious studies when I was in college, and now I have the opportunity to explore some of these issues from the starting point of "and now for something completely different!" The best example I can give to this, is that while working on the second story of the series, it was important for the flow of the story to have some of the characters have a real aversion to going to the hospital. I didn't want to leave it unexplained, so while I was pondering possible motivations for not seeking medical attention, I then asked myself, "What would the state of medicine be like in a world where faith healing not only worked miracles, but was relatively commonplace?" And how much would this make religion even more influential both politically and personally? And what kind of tensions would arise between "Religion" and "Magic" and "Secular" based medicine. This is now the basis for the third book in the series, and will be a recurring undercurrent throughout many future stories. And yet none of these stories make sense, unless I have the opportunity to step outside the real world and re-write history in its entirety. BB: So how'd Phil Singer get involved, and what made him the guy to visually realize Milk Cartons? KT: Actual Phil was involved from the very beginning. After college I went to the Kubert school, where I first met Phil. We were roommates for four or five years, and we worked together on various projects, including the original proposal to Epic. The difference was, I was the penciler and he was the inker. As a matter of fact, all the panels of art that appear in the afterword of Milk Cartons is from that proposal. Now it's ten years later, and although life and circumstance make it impossible for Phil to commit to working on a series like I currently envision Stonehaven, he just couldn't say "No" to 'finishing' that first project together. And I, for one, couldn't imagine anyone else doing this particular story. BB: How did you two work together? Did you present him with full scripts which he adhered to closely, or did he have some real input into the storyline as well as the look of the book? KT: Phil and I have worked together in a variety of different ways, but in this instance he was indeed given a full script, compete with dialog. And he chose to adhere to that script very closely. If anything, I had to keep telling him to break out a use a little more of his own creativity on the pages. Although his input on the story was limited to little more than inspiration to me, the impact he has had on the overall look of the book can not be overstated. Now that I am doing the art chores on the second book, I find myself looking back at Phil's work for guidance. BB: What lead to your decision to incorporate the digital cityscapes and settings, and what were you trying to accomplish with that effect? KT: This was more of a confluence of circumstance. Incorporating digital images is something I've been doing to varying degrees of success in my own artwork. And while working on my first graphic novel, the Festering Season, the artist (Tim Smith 3) and I kept falling under a great deal of deadline pressure. Now with that particular story, it was extremely important to me, both editorially and artistically, to render the actual New York City locals accurately. Since there wasn't enough time in the day for Tim to draw all of these settings to my uncompromising standards, I started going out and taking the pictures that ultimately got placed in during the coloring process. This ended up saving both time and Tim's sanity. Now Phil saw what I was doing on the Festering Season, and generally liked what I was doing. Although we had the luxury of creating Stonehaven from scratch, Phil knew I was looking for a distinctive architectural feel to the city. Next thing I know, I'm getting pages with figures standing in front of signs that read, "This looks like a good spot for one of those photo backgrounds!" BB: How about the book's palette? What kind of factors influenced your choice of colors and tones for the book, and what effect were you going for with that look? KT: Again I have to go back to The Festering Season. As anyone who reads comics should already know, printing is expense. And four-color printing is extremely expensive. 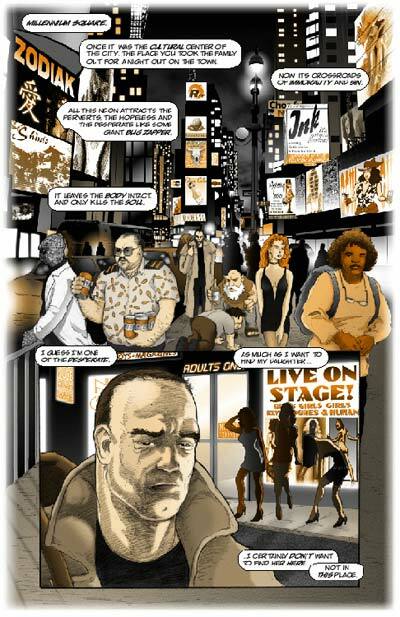 A brand new 200 page full-color graphic novel would have had a cover price of about $40. Don't take my word for it; just think how much would it cost to buy 10 issues of your favorite color comic magazine. So, originally, I intended to print Festering Season in black & white grey tones. We even did the entire first chapter that way. But it was just lacking that extra "oomph" that I felt it needed. And then I remembered an old art history lesson about Norman Rockwell. Before 1916, The Saturday Evening Post, like so many other magazines of the time, printed their covers in two-color, because four-color printing was so expensive. This means that when Rockwell first started working for the Post, he was required to paint his illustrations in tones and combinations of red and black (the colors used for the Post's logo). So I figured there was no reason we couldn't reproduce 100 year old success story using today's technology. And my ultimate choice of color was that which produced the best flesh tones for all ethnic groups. BB: You mentioned earlier that this was but the first of a series of tales based in this setting, which leads to the question of how much new territory can be discovered in the next book ... and how many tales you might be able to tell set in this particular universe? KT: Well, as far as story possibilities, I feel those are endless. But only a limited amount of new territory can be covered in any single story. As I mentioned before, this first story relied very little on many of the fantasy aspects of the setting. That will not be the case for future stories. Right now the second book, Subterranean Hearts is completely scripted, and about a 1/4 complete. I have outlines written for five more stories, and loose notes for about a dozen more. And the more I write, the more the ideas seem to flow. BB: Well, what can you tell us about the next installment of the Stonehaven stories? KT: Subterranean Hearts features an almost incidental character -- appearing on only 5 pages from Milk Cartons -- in the leading role. Teri Rieca is a magic student at the local university who has had her scholarship revoked, and must supplement her income by taking a job at an extermination company. Of course, in Stonehaven, that means dealing with ghosts, trolls, and various other nasty critters. This tale also introduces us to new players in Stonehaven's ensemble cast. 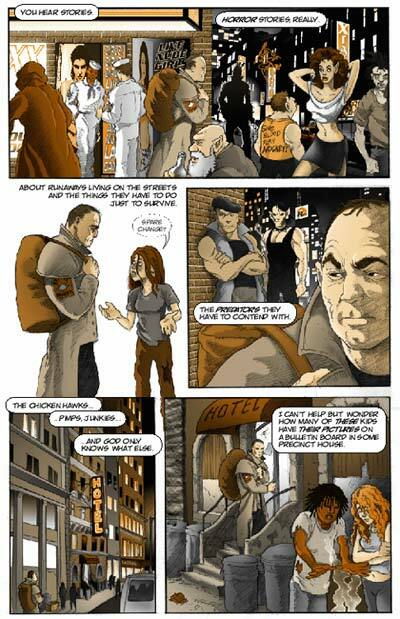 Victor and Meili return as adversaries fighting for the life of an emotionally disturbed teenager. Fate and circumstance leads all parties into unexpected danger in the bowels of the city's sewer system. 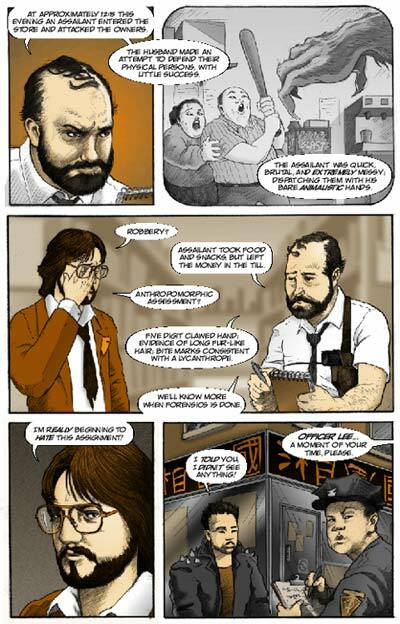 BB: What about the world and characters of your first graphic novel, Homebrew: The Festering Season? Will you be returning to that setting any time soon? KT: Probably not in the immediate scheduling future, but I do have two very rough story outlines sitting on my hard drive. In fact, I was originally working on Milk Cartons when the idea for Festering Season came upon me. It was one of those rare moments of inspiration that all too seldom occur. The polemical aspects of the story had such an immediate sense of urgency for me personally, that I felt compelled to move it to the top of the schedule. Unfortunately, the follow up stories do not have that same sense of urgency, so I'm focusing on Stonehaven for now. BB: Anything else in the hopper that we should know about? KT: I'm thinking about doing a couple more computer graphic how-to books. Probably narrower in focus, and less comic book specific, but still applicable to the industry. BB: So, what do you get from doing this kind of work that you don't get from the day job? KT: More and more this is becoming my day job, which is great. But this work is what I love to do. It gives me the most satisfaction and sense of accomplishment. Although I take great pride in my other work as prepress and publishing consultant, at the end of the day, it's just paying the rent. 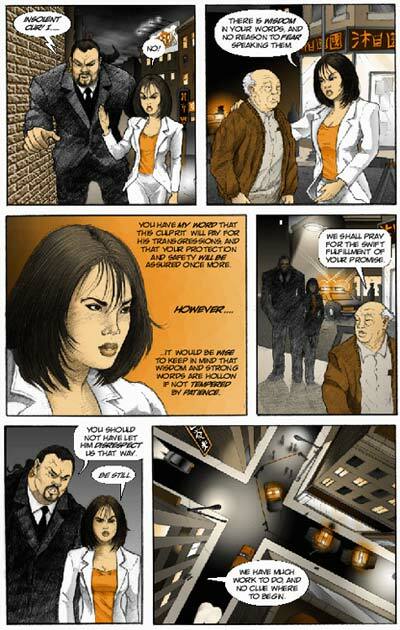 Most of my other comic-related work these days has been along the lines of consulting work for such books as The Matrix Comic graphic novel from Burlyman Press & Red Pill Productions, and Anti-Star from Destination Comics. BB: What do you hope readers get from your books? KT: First and foremost, I want to entertain. I want the readers to remember the story, and care -- or despise -- the characters. I also want to make people think about their beliefs, relationships with others, and the world in which we all live. KT: Well, I would encourage people to check out my website, www.stickmangraphics.com. In addition to getting information on the books we've talked about, I also have a free self-publishing resource guide. It's sort of an online companion to my first how-to book: Digital Prepress for Comic Books. That one's still my best selling title, and you can check that one out online as well. Stonehaven: Milk Cartoons & Dog Biscuits, the latest graphic novel from Kevin Tinsley's Stickman Graphics is scheduled to hit the racks today and is concurrently available in both softcover [ISBN: 0-9675-423-4-0] and hardcover [ISBN: 0-9675-423-3-2]. If your local comics shop or book store doesn't happen to have a copy of it, it's readily available for reorder via Diamond Comics, Cold Cut, FM International, Ingram Book Company, Book Wholesalers, and Baker & Taylor, Inc. As noted above, you can hit Kevin's website -- www.stickmangraphics.com -- for copies of this or any of his other fine books.